Capitol Police arrested almost 600 people protesting immigration policy. Several hundreds of protesters, mostly women, joined by Democratic lawmakers, took center stage on Capitol Hill in a protest of the president's immigration policies on Thursday. Chanting "WE CARE" and "ABOLISH ICE," the protesters are demanding Congress act to end Trump's policies that criminalize and detain undocumented immigrants and separate detained families. ICE is a common acronym for the U.S. Immigration and Customs Enforcement agency. 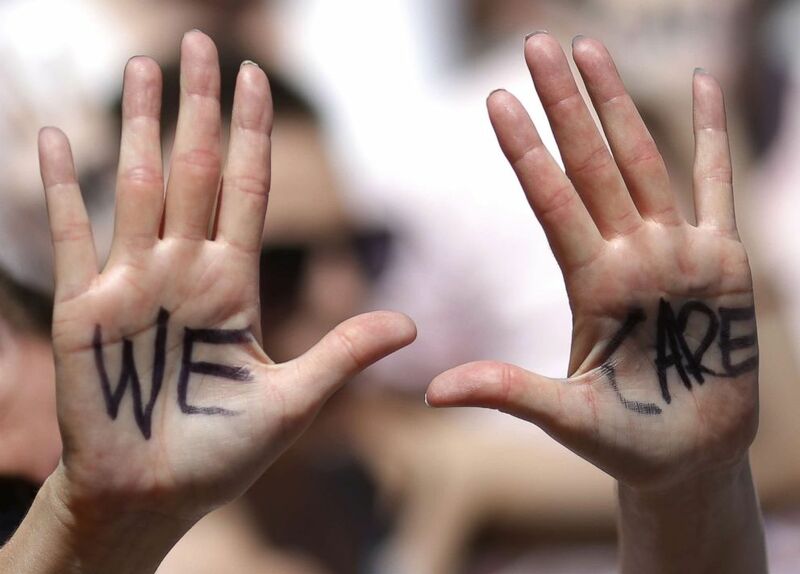 (Win McNamee/Getty Images) 'We Care' is written on a protester's hands during a march from Freedom Plaza to demonstrate against family detentions and to demand the end of criminalizing efforts of asylum seekers and immigrants June 28, 2018 in Washington, D.C.
“Women are outraged at the separation of families,” said Linda Sarsour, one of last year's Women’s March Organizer. “We are outraged of all the things that are unfolding in our country." "We are here to say we’re ready to sacrifice and we’re ready to leave our jobs, leave our families to come and take this act of civil disobedience here,” she said. US Capitol Police arrested 575 people at the protest in the Senate building and charged them a $50 citation for unlawfully demonstrating. Rep. Pramila Jayapal, D-Wash, and actress Susan Sarandon both tweeted they were arrested. 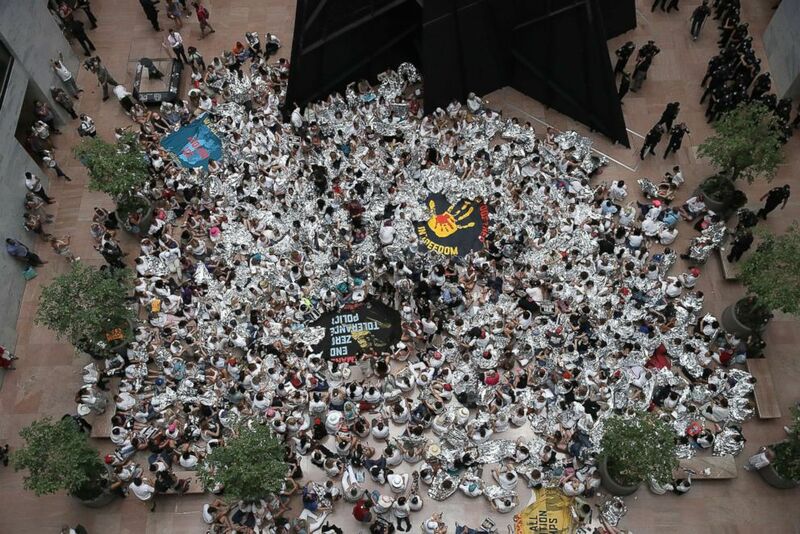 (Win McNamee/Getty Images) Protesters that marched from Freedom Plaza to the U.S. Capitol demonstrate inside the Hart Senate Office Building against family detentions and to demand the end of criminalizing efforts of asylum seekers and immigrants, June 28, 2018 in Washington, D.C.
Congresswoman Sheila Jackson Lee of Texas called for ongoing mobilization beyond Thursday's protest. People showed their support through handmade signs, including one that read “Don’t have a heart of I.C.E.” Others marked “We Care” on their palms. Still, other protesters wore jackets with “I really care. Do you?” painted in white on their backs, a reaction to the controversy that followed First Lady Melania Trump’s trip to the southwest to visit detained children. As she boarded a plane in Washington D.C, photographers could clearly read the message "I really don't care. Do u?" on the back of her jacket, which reportedly retails from Zara for $39. While the First Lady took the jacket off before exiting the plane, it was widely seen as an inappropriate choice of clothing.